First, a word on graphics. I remember old TSL that still used color extensively. An interim version this changed to grayscale. Turns out this greatly improved the looks! An excellent example of less is more, although in few cases game suffers because of this. Graphics was integrated in latter versions, around six years after development started. For this article I opted to use traditional interface screenshots. 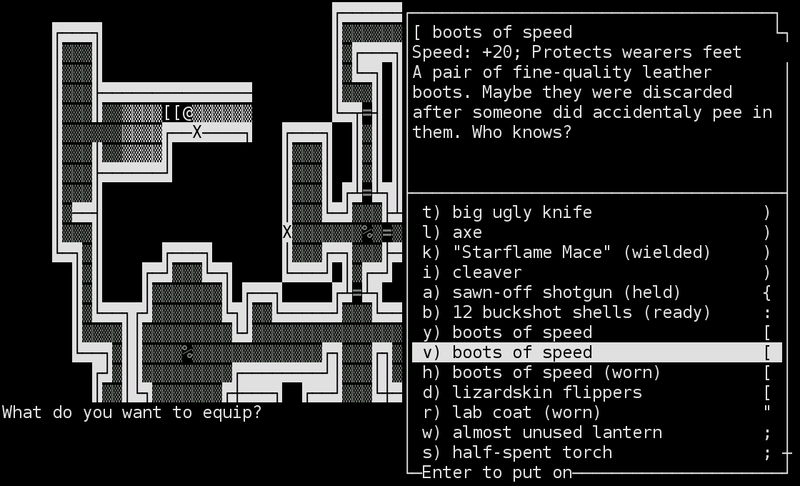 One of the first few things I check in a new roguelike is in game help. Here it is presented in eleven neat pages, a great primer on survival. Moreover the first section is useful as quick key reference. This is considerable improvement over The Slimy Lichmummy Manual which accompanied earlier versions of TSL. Readme.txt files are generally disliked by players, seldom being read. Also, the author had to explain that it was the Lichmummy that was slimy, not the manual. What sets The Slimy Lichmummy apart from common roguelike is character improvement system. There is no experience to gain. You hunt for equipment, food, skills and augmentation capsules. In general it is beneficial to skip fights which do not end in gain for the player and can be avoided. Next major departure is no less important. Health is accumulated resource. Any healing item always works, without ceiling on how many points you can have. This is taken even further by making medkits work like powerups. Since there is no automatic regeneration one has hardly any reason to linger around. On the other hand monsters never stop respawning. With time respawn rate increases apparently without limit. Mentioned earlier were four types of things players desire. I start examination from the last as it changes game the most. Augmentation capsule is a location which when entered offers important choice to make. A capsule will offer you a choice of one out of two randomly chosen upgrades. You get one but the other does not just get rejected. TSL will never offer it again, no matter how many other capsules you will find. Most improvements are very useful, some are good enough to be almost game changers. For me the choice was very often a difficult one. Later on I learned datajack is often bad pick because one usually finds far more dataprobes than terminals or otherwise hard to disable force fields. To get an idea how tough the choice is think what would you decide to get when presented with synthetic lungs to ignore toxic gases and have easier time swimming or take blood filter circuit which will render any poison quickly neutralized. Another time it will be exoskeleton to serve as universal indestructible armor or built-in cloaking device for easier sneaking around. Yet another time choice will be between matter transmission ability to phase through obstacles or a capacitor to store more energy and regenerate it faster so you can power more of your abilities or spells. Value of most of those will vary depending on your collected equipment so far, explored branches, found skills, playstyle and of course other augmentations possessed. Skills are second vital asset to obtain. Several can be gained through augmentation capsules but most are learned by reading books. Using them requires some Energy Points. Ordinary maximum EP is three plus number of known skills. It is possible that you will not be able to use freshly acquired skill due to EP requirements exceeding your current potential. Well, just learn more or get lucky and have the capacitor. Also, beware of book reading failure. A nameless horror may be summoned in worst case! Have your reading session near a blink trap or have other escape method handy. If the book proves to be of the hungry variety just wait it out. Magic you can obtain from successful read are many. A special mention is given to the Deathspell which with equal probability kills either you or target monster. This can annihilate anything, even elder lichmummy in single hit but it is mostly a last resort thing or a tool for the reckless. 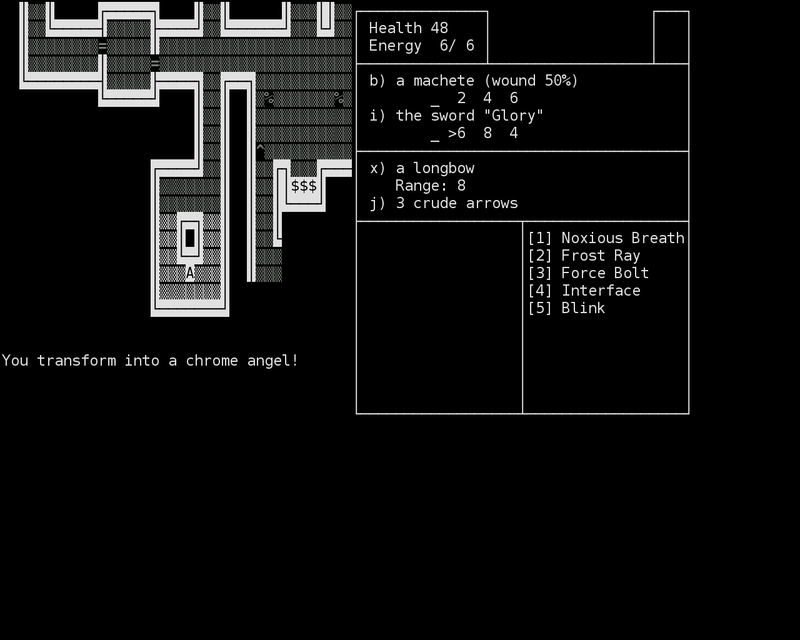 Given permadeath nature of roguelikes casting a Deathspell is the greatest gamble possible to make. Another thing to hoard is health. It is good to collect as many medkits as possible. Next best thing are food items like corpses or carcasses. When trying to off some inhabitant for its delicious hide try to win unscathed – only then the single health point gained will be worth it. Apropos eating, in TSL you feast only for one thing: gaining health. There is no hunger and no real point to carrying most sources of food. Just consume the stuff on the spot. The fun part begins when you have nothing to eat game asks you to pick something from your whole inventory anyway. Bad part of that deal is you get to instantly die if you decide to consume a sword (you cut yourself up), buckshot shell (lead poisoning) or either scroll or boots (50% chance for choking). In my view such instant deaths are cheap mechanical solutions. Sword could take ten health points, set wounded status and leave the weapon intact. That would be still as fun but not as punishing. Same for the buckshot which could strongly poison. Still a bad idea to eat it but if you have elixir handy then why not just for the laughs. Although footwear and scrolls are justified because they do give one health point, a one time warning would be welcome. In corner cases it may be worthwhile to eat these. Otherwise you are better off polymorphing into nonbreathing entity. Last exception is the seaweed cloak. Eating unidentified cloaks is safe way to identify these. Among “regular” edible items are remains of dungeon inhabitants. I find it flavorful for monsters to have specialized corpses. For example gnoblins and ratmen leave decapitated heads. You may also find cheese on the latter. Ogre corpses are very heavy, while most animals leave significantly lighter carcasses. Then you get some odd ball remains like severed hands which are dropped by none other than severed hands. What surprised me you cannot consume cranium or bones. Final thing to collect is equipment. Items available span many themes. There is a lot of classic fantasy roguelike stuff like wands, magic books with a will of their own, swords, axes, hammers and other such weapons. Artifacts are present. Some need to be identified, others become known through use, a few have their own quirks. For example certain trollish weapon deprives you of your literacy. Mixed into this are shotguns, grenades, metal pipes, fire extinguishers, electric prods, rifles and other modern appliances. To top things off augmentation capsules offer cyberpunk style enhancements for player character. However, you need to be considerate as to what to leave behind and what to take because it is easy to get burdened. If you carry too much monsters get double turns on you which can quickly prove fatal. Weight management is made harder by need to carry enough light sources of which nearly all are depletable. Also, torches and lanterns you find commonly are partially used up. This encourages tiring behavior of putting your light source off every time you need to backtrack. Stashing is only a temporary measure because going back to your stuff costs time and lost time means higher monster generation rate which means trouble. To make matters worse weight of items is not explicitly known. It would be a giveaway in a lot of cases but without this information I found myself dropping and picking up things a lot of to get a feeling what is heavy. My common sense has proven insufficient. The inventory screen itself is peculiar to say the least. It is simple to use but also a terrible failure at the same time. The central idea appears to be following some king of “Do What I Mean” approach. Unfortunately TSL notoriously fails at it. In inventory mode pressing a letter will jump to an item keyed by it. Except for ‘d’ which drops currently highlighted item. In drop mode ‘d’ does jump though. In basic inventory mode standard action on every armor is to equip or take it off. Not for Mail of Life though. It will use the charge in that case. Then there are oddball items like cranium for which hint will read “enter to BUG”. To make matters worse is no sorting available which makes it hard to take a general overview of carried items. Having examined things the player desires in order to win it is now time to focus on what the game has to make this goal harder. These things are monsters, traps, harmful items and other miscellaneous obstacles. I found monsters in TSL to be most refreshing bunch. None of that giant rat, giant bat, orc, kobold and other overused fantasy roguelike enemies. Most recognizable are gnoblins which judging by the name could be crossbreed of gnolls and goblins. Then you get to meet gravelings, chainsaw ogres, burning skulls, floating brains and chrome angels among your foes. Most have something unique about them. If you survive long enough such varied menagerie TSL may serve you the doubtful pleasure of getting slapped by floating demon genitalia. Unique monsters are quite tough, with powerful attacks but some also carry some reward for defeating them. For example offing the Necromancer yields two random scrolls. Other may simply block off a sizable part of level as Lurker tends to do. There is a rather classic looking dragon but it is handled somewhat inconsequentially. The dragon is clad in dragon scales which grant enough fire resistance to make walking on lava painless. In spite of this the dragon somehow does get burned by walking on lava and the scales if dropped there will burn up too. To top it all off polymorph may turn you into any creature in game except uniques. However, it is generally dangerous choice. Sure, you might turn into something cool or powerful. There is a variety of monster abilities just waiting for you to make good use of them. Being a swimmer in Drowned Caves is great. Electric snake, ordinarily one of weakest creatures out there can recharge items. Transforming into some nonbreathing ediate allows one to dine on unwanted scrolls or footwear. On the other hand a weak form may force you to fight burdened, forbid you from opening doors or use equipment. At the worst end the acidic slime is a possible target. If this happens you will drop everything equipped and then dissolve it, obliterating your whole inventory in single turn. This can possibly ruin even an endgame capable character. Killing monsters shows how well The Slimy Lichmummy uses message log. Descriptions of combat are full of horror and gore. Beat a monster with your bare fists? You probably choked it to death, maybe delivered punch to the face causing it to choke on its own teeth or perhaps you have twisted its neck until it snapped. Using cutting weapon? Slit throats, decapitations, people cut in half and other creatures falling down clutching their disemboweled guts are part of combat. Then there are some creatures who may die taking their last breath looking you in the eye. 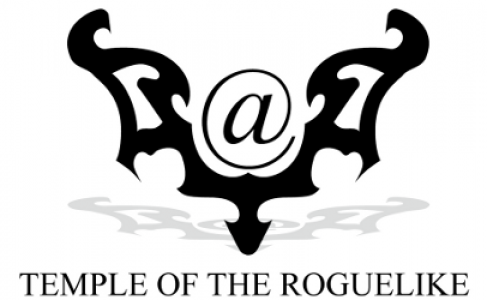 Roguelikes are typically heavy on fighting and it is expected you will be killing many other dungeon inhabitants but despite that TSL managed to get me thinking whether I really want to be doing all this stuff to every encountered living thing. This is telling because to be honest there is little point in fighting all encounters. There is no experience and killing other creatures can only provide you with some of their meat and maybe some equipment. Many monsters can become an obstacle if disturbed making it necessary to dispatch them but often an attack will be net loss of health. It is worth to hunt for valuable items like medkits, food, ammunition, books and scrolls. You receive the most power by seeking augmentation capsules. If any of those can be won fight may be worth it. Speaking about combat, the system present in this game is something I have not seen done anywhere else. Weapons have sequences of damage they do each consecutive turn of combat, regardless of which foe the attack was directed at. After sequence is exhausted the counter wraps back to the front. However, disengaging in the middle of sequence makes your weapon unready, forcing you to spend a few turns without attacking. Equipping new weapon also imposes some delay. The sequence system allows to easily have many melee weapons be distinct. It also complicates decisions which weapon to keep – there is no obvious more average damage relationship by which to sort weapons. Special abilities which many weapons have further adds to interesting choices. Finally dual wielding pairs two weapon sequences always picking higher of the two damages for any phase. Traps are the second large threat to care about. You cannot find them by searching. This is good because it removes a common source of tedium in roguelikes. However, at the same time it feels bad because the only way to avoid stepping on that electrified plate is reading the scroll of trap detection. Well, a monster also could reveal it to you but this is rare. It seems as if you get punished at random for no fault of your own. On the other hand scrolls of trap detection become really valuable resource because they can save your health and decision in what place to expend them is strategic one. Dart traps are somewhat better in this regard. Being multiple use devices they have some utility against enemies after discovery. Broken glass just takes away one hit point unless you wear boots. Still, that does not make lead boots useful. Huge penalty to stealth and speed renders them trash. Then there are webs, blink traps and polymorph traps. The last are especially useful against hostile creatures. Add lava to the mix to have the perfect hazardous environment required by adventuring professionals. TSL could do better with trap symbol assignment though. Several common symbols remain unused while all kinds of hazardous terrain features are represented by a caret. Among them is lava. Tracing a webbed (also represented by ^s) path through lava swamp is tedious. ADOM style look command could ease the problem somewhat. Having webs marked by ‘|’, lava by ‘=’, electrified plates by ‘~’ would unclutter the view sufficiently. Most importantly your path to ascension terrain tile is also a caret. To add salt to open wound the feature is vulnerable to wands of Destroy Trap! Curiosity combined with NetHack mentality compelled me to try this combination and get unrewarded for my diligence. Oh, well. Also, beware of mistyping directions with the wand near medkits. Those are also vulnerable for some inexplicable reason. 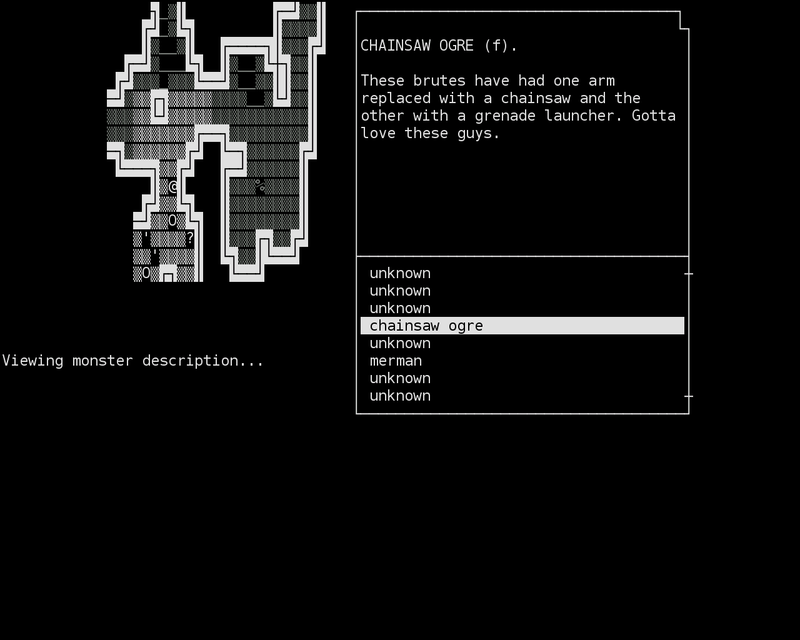 Third threat category features the scroll of amnesia. Upon reading it wipes whole current level map memory. To make it sting the scroll does not identify itself. It really could, because this is defeated through labeling. Just annotate the scroll before reading. There are also lead boots which when worn unidentified will covertly slow you down, ruin your stealth and make it harder to swim. They also weigh a ton which is easiest way to informally identify them. Other items do not bring harm but may have little use. 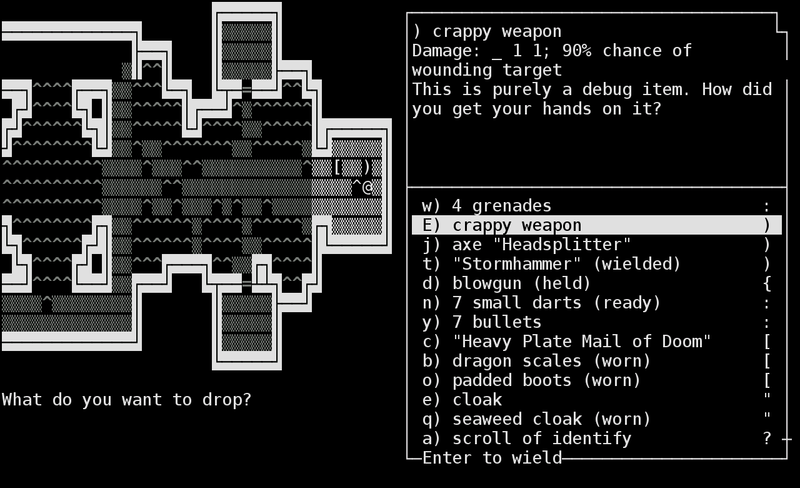 If you are especially inquisitive you may get possession of aptly named crappy weapon which breaks after a single hit. They are often found on gloom lords. The Slimy Lichmummy is quite eager to serve you boring obstacle of “no way to progress, guess where the secret door is”! This is especially annoying due to branches in levels. Occasionally fully exploring several places leaves you guessing which place to check first for the door. Somewhat lessening the problem is unique approach to searching. To check a wall for hidden door it is sufficient to bump into it once. Without separate search command or requirement to kick walls exploration is usually halted for a brief time only. Dungeon itself also throws obstacles. Mildest of those are locked doors. There is only one type of key and it stacks but each is gone after single use. Having no key you might want to bash down the door. This is noisy but often succeeds within first few tries. If you have a crowbar single try is going to be sufficient. A notable obstacle you may find on your way are force fields. These block passages quite effectively. Thin fields may be phased through if you have the means. Another way of bypassing them is disabling or destroying generators supporting the fields. Any weapon with explosive damage can do the trick. Fireballs or grenades are common tools for wrecking these. In a pinch thrown lantern will also do since it deals explosive damage. Alternative is datajack from dataprobe or augmentation. Of course one may just walk through them but this carries significant health toll. Looking from a distance The Slimy Lichmummy manages to successfully live up to a diverse theme. Cyberpunk augmentations and body horror are mixed with fantasy magic spells learned from books. The game features with modern day arms like shotgun or grenades coexisting with a trollish axe which magically strips you of your literacy while you wield it. You have force fields protecting stashes of longbows and crossbows. There is choice to solidify lava by zapping wand of frost or using an extinguisher. All this together produces eerie feeling of dealing with anachronism stew but considering how alien and varied is the menagerie everything seems to fit in the end, although it is hard to give this mixed theme a name. TSL has broad feature set with inconsistent polish. There is rich combat narration next to sorely lacking item and monster description set. You will find nicely varied treasure but to maintain it you need to use an awful inventory system. From graphical side there is a very thoughtful color choice contrasted with poor glyph assignment. Fortunately interesting monsters, atypical spell set and the augmentations swing the balance strongly for better. Previous Post Transcript of Interview with Glenn Wichman is now available! Next Post Roguelike Celebration 2017 Coming up November 11! Good assessment of the game’s strengths and weaknesses. TSL does more right than it does wrong, but a player will need to be willing to overlook those rough edges. It’s worth the effort though, being a pretty unusual and distinctive game.